The Alpaca Registry has just released the 2013 Expected Progeny Differences (EPD) results, and we are once again thrilled with the results. A number of our alpacas are featured in the top 1% on several fiber characteristics, many others ranked in the top ranks of alpacas across the country. 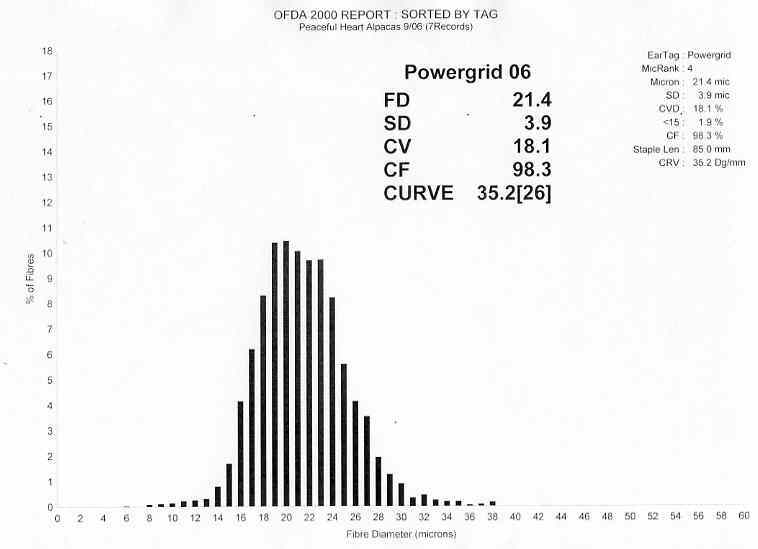 You may remember our post regarding our herdsire Powergrid being ranked number 1 in last year’s EPD standings for Standard Deviation of Average Fiber Diameter. You can read more about that here. Read on for news about our EPD stars and further description of how we use the EPD data in our breeding program. Snobelle is a relative newcomer to our breeding program and is our Number 1 Star in the EPD program this year. We were already extremely impressed with her first cria born on our farm out of Lord Tennyson, Wild Bells, but were thrilled to see her EPD results. 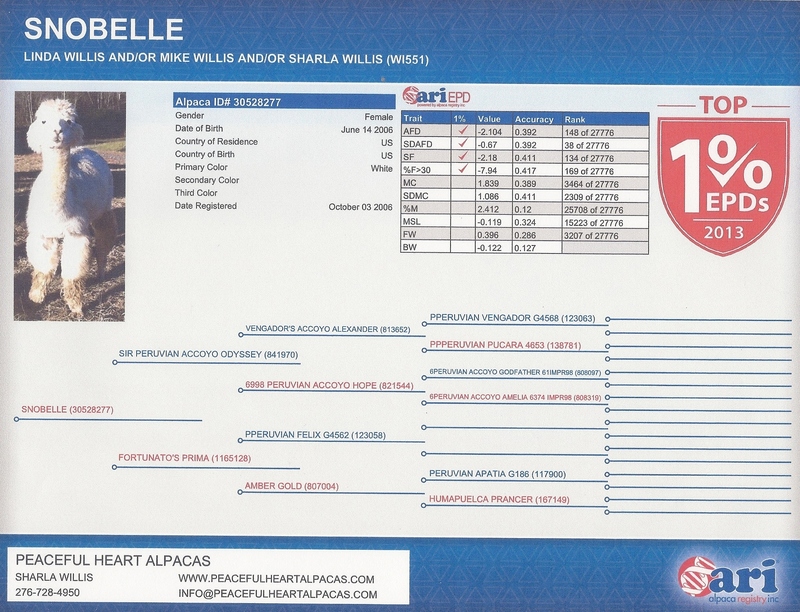 Snobelle ranked in the top 1% in four different categories related to the fineness of her fiber Average Fiber Diameter (AFD), Standard Deviation of AFD (AFDSD), Spin Fineness (SF), and percent of fibers less than 30 microns, and in the top 12% in Fleece Weight and Mean Curvature (which measures crimp). This year, the Alpaca Registry is featuring the top 1% with a red shield on their pages to denote their elite fiber status. Another star on the farm is Lucky, with top 1% ranking in AFD, Standard Deviation (AFDSD), Spin Fineness (SF), and top 5% ranking in fibers under 30 microns and % Medulation, as well as top 10% in Mean Curvature (a measure of crimp). Ima Joy and her daughter Angelica both ranked in the top 1% in the lack of medulation category (% Medulation). Of particular note, was Powergrid and many of his offspring being in the top 1% related to the Standard Deviation of Average Fiber Diameter. The list included not only Powergrid, but his crias Marcus, Elise, Ziva David, Lightning Bolt and Solar Flare. We were pleased with the number of our alpacas included in the top 5 and 10% rankings among alpacas in multiple characteristics. We will take this data and use the areas in which each alpaca was strong or weak to make more informed breeding decisions to further improve the next generation. EPDs are used as part of the data we use to consistently improve the fiber characteristics of our alpaca herd with each generation. Breeding decisions are one of the most important ones we make as alpaca farmers. So, we use all the data we can to make the best breeding combinations each season. We evaluate our alpacas in a number of ways, including a hands on assessment and scientific analysis of their fiber. Each year at shearing time, we take a sample from the fleece of our alpacas. 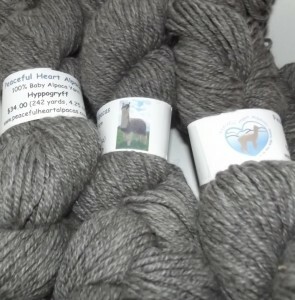 This sample comes from the midside of the alpaca, and is sent to Yocum-McColl fiber testing lab where it is assessed for a number of traits important to alpaca breeders, including: fineness, measured as Average Fiber Diameter; consistency of the fiber diameter across the sample, measured as Standard Deviation; Comfort Factor, measured by the number of fibers under 30 microns in diameter (fibers above this will ‘prickle’ skin when in a yarn), % Medulation which also contributes to the soft feel of alpaca fiber; Staple Length and Fleece Weight. From that analysis, we receive a histogram for each alpaca detailing their fiber statistics. That report is also sent on to the Alpaca Registry (ARI) who yearly use this data from alpaca farmers across the country to generate EPDs. EPDs are used in many livestock industries to guide breeding decisions. They help us by giving a numerical value to show which alpacas are most likely to pass on specific fiber characteristics, and incorporate not only the data from individual alpacas, but also their ancestors and offspring to further enhance the accuracy of this information and give us guidance as we plan for the next generation of alpacas. We have many wonderful alpaca gift ideas for those on your Christmas list. You can also browse our online store, come by the farm to visit the store (and see the alpacas), or give us a call for suggestions. 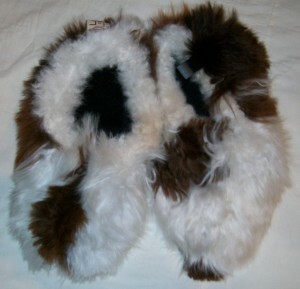 Alpaca Slippers: Our number one best seller for Christmas is our beautiful alpaca slippers. These incredibly comfortable and warm alpaca slippers are reversible. They can be worn with either the alpaca fleece or alpaca fabric side out for two different looks and feel. Available in sizes Extra Small to Extra Large, they will fit everyone on your list. Alpaca Sweaters: Soft and warm, our elegant alpaca sweaters come in a variety of styles. Our cardigans have been our most popular sellers, but we have been adding some new pullover designs that people are loving as well. Alpaca sweaters are wonderfully warm, but their lightweight fiber keeps people from becoming too hot while wearing them, making them perfect for indoor and outdoor wear and a wide range of climates. The strength and durability of alpaca fiber means these lovely sweaters will be a gift treasured for years. Alpaca Teddy Bears: Loved by all, our soft and cuddly teddy bears come in a range of sizes from 3 inches to 15 inches tall. They also come in many different colors from the natural white, fawns, browns and multicolor bears to our lovely pastel and bright colored bears. One hug, and they’ll never want to put these beautiful bears down. Alpaca Yarn: I often get questions similar to the following, “My relative/friend loves to knit/crochet, do you think they would like some yarn as a gift?” My response is always the same, “Yes.” As a fellow yarn lover, I know that one or two skeins of a lovely yarn can always be turned into a beautiful hat or scarf, or incorporated into a project with some other yarn from my stash. If you’re looking for something more specific, choose a pattern you know they’d like and get the yarn to go with it. 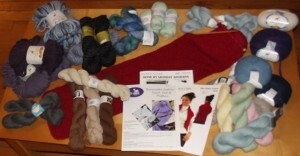 We have a big selection of patterns, which list the yarn requirements right on the webpage. You can browse our yarns and patterns online or in the store, or consider giving a gift certificate for your yarn lover to choose their own project. Alpaca Scarves: We have some beautiful and incredibly soft Alpaca Scarves available in both solid colors and patterns. 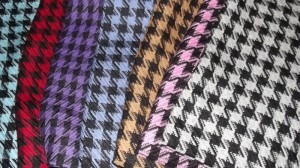 One of our lovely new patterns are the houndstooth scarves available in seven different colors. We also have some of our hand felted scarves available, made here at the farm with fiber from our own alpacas. 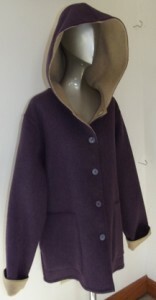 Alpaca Coats: Our Reversible Alpaca Coats offer two coats in one in a classic style that can be worn daily. Wear it with either jeans or slacks for a dressy or more casual look. It has a comfortable fit that closes with 5 buttons up the front. It has two pockets on both sides of the coat. The coat falls about mid thigh, and has sleeves that can be rolled back to see the complementary color on the reverse side allowing the sleeves to be adjusted to one’s preferred length. You can see our current selection on our webpage, though we will be adding a few new coats soon to replace some recently sold. Alpaca Socks: Throughout the year and especially at Christmas, alpaca socks are a favorite gift. Our two most popular socks are our warm and soft Therapeutic Alpaca Socks and Alpaca Boot Socks. These socks will keep you warm throughout the winter. We also have a great alpaca sock with alpaca shaped non-skid strips on the bottom, which are perfect for wearing around the house or while doing yoga. Our thinner dress sock is an incredibly comfortable alpaca sock perfect for year round wear with slacks. We have just added a new style to our alpaca sock selection, and I am really finding them comfortable to wear (pictured here). They are an ankle sock perfect for wearing with tennis shoes. And just in time for Christmas, we have a super soft alpaca children’s sock for kids ages 2-9. Alpaca Blankets: Nothing feels better on a cold winter day than snuggling up under a soft and warm alpaca blanket. We have a wide selection of blankets in solid colors, and patterns such a herringbone and plaid. 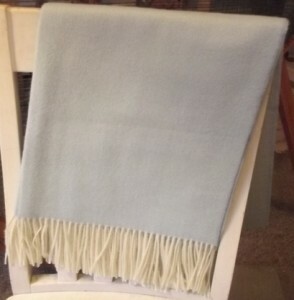 Most of our blankets are in the natural alpaca color range such as grays and browns, but we have a few colorful blankets in blue, green or red. You will be amazed by their lightweight feel and perfect warmth. 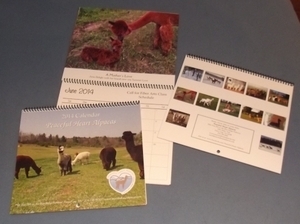 Alpaca Calendars: Each year since 2010, our farm has created a wall calendar full of pictures of our alpacas hanging around the farm. (A special thanks to Karen Bopp for the original idea, design, and first few years of calendar pictures.) We try to include a mix of closeup pictures and larger group shots with our lovely Blue Ridge Mountain views, and of course we have plenty of pictures of our sweet alpaca crias. Several people have told me they save the calendars each year for the pictures (my favorite this year is April). 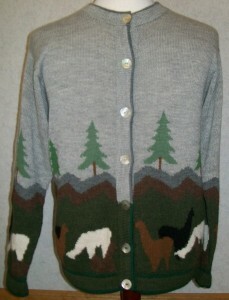 A perfect gift for any alpaca lover. 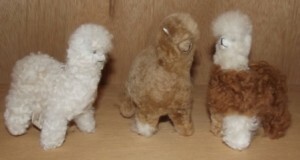 Alpaca Plush Toys: We have soft and cuddly alpaca figures in a variety of sizes up to 14 inches tall, but our most popular alpaca for Christmas has always been our 4 inch alpaca figures. 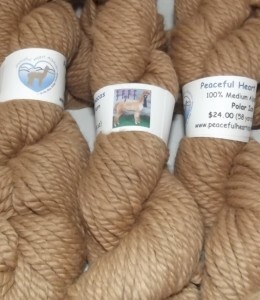 Hand crafted from 100% alpaca, around a wire frame to help them stand upright, and stuffed for softness, each alpaca is as unique as those in our pastures. They come in a variety of colors. These alpacas are popular with kids and adults, and we know people of all ages who look forward to adding a new alpaca to their mini-herd each year.